introduces the capability for a customer to initiate VZW 4G LTE cellular service directly from the mobile device via the Online Portal. isn't available for Smartphone activation. Device must be in a Verizon Wireless Broadband area to utilize the Self Activation portal, refer to the Coverage Locator for additional assistance. If outside the Verizon Wireless Mobile Broadband area, please contact 800-786-8419. Power on the new VZW device. For first-time setup, launch a web browser session. Select the desired price plan, complete the account setup tabs then click Continue. From the completed transaction screen, ensure to save and note account info for any future reference. The billing and cellular data plan information in the image below are examples only. 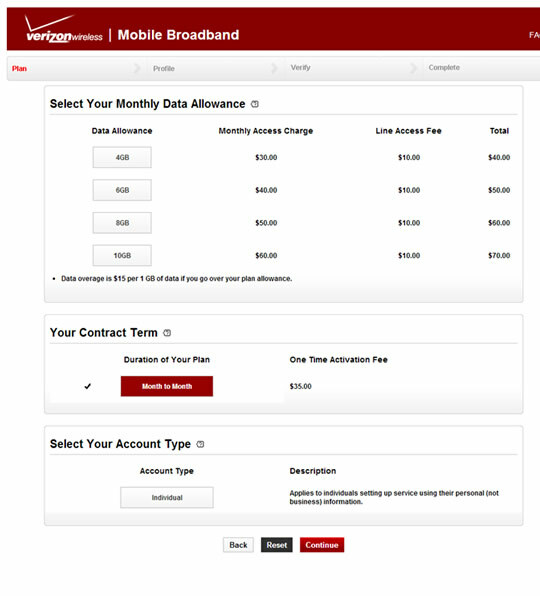 iPad users sign up for Verizon service. From the home screen on iPad tap Settings > Cellular Data > View Account. Chromebook users utilize the Chromebook client to complete set up.